Because Canada was not yet an independent international actor, Britain’s declaration of war was also binding on Canada. In August 1914, Britain and France went to war with Germany. The Canadian government immediately offered Britain troops for overseas service, although Ottawa controlled the level of Canada’s military participation. Most Canadians greeted the outbreak of war with enthusiasm, especially those born in the British Isles who volunteered in large numbers. They were unaware, along with the rest of the world, of the horrors that twentieth-century warfare would bring. 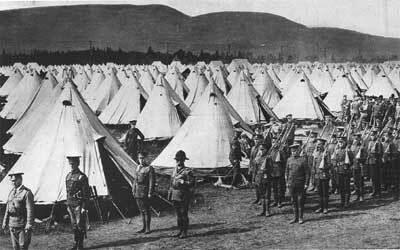 Recruits were gathered and given basic training at the hastily-built camp at Valcartier, Québec. On October 3, the first 32,000-strong contingent of the Canadian Expeditionary Force sailed for Britain. The British colony of Newfoundland also sent 500 troops at this time.